Darin John Albright, Age 55 of Manistee died Tuesday evening September 5, 2017 at his home surrounded by his family. He was born in Manistee on March 31, 1962. Darin was the son of Norbert & Ann (Meduna) Albright and Janet M. Kellogg. He was a 1980 graduate of Manistee Catholic Central. On September 15, 1984 he married Terri Lynn Tosi at Guardian Angels Catholic Church in Manistee. 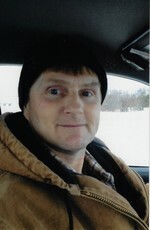 Darin was a HVAC installer, having owned and operated Albright sheet Metal in Manistee. He also had been employed at the Little River Casino. Darin was especially proud of having installed along with his father the copper roof on the riverfront gazebo. He loved to camp, hike, travel, & spend time with his kids. Survivors include his wife; Terri Lynn Albright, two children; Joshua (Danielle) Albright of Interlochen, and Heather (Ashley) Albright of Dayton, Ohio. Also surviving are in-laws, nieces, & nephews. He was also preceded in death by two brothers; Gregory and Randy Albright. Memorial Services for Darin J. Albright will be held Saturday, September 9, 2017 at 4:00 PM at the Oak Grove Funeral Home & Cremation Center in Manistee with Pastor Patrick Pointer officiating. The family will receive friends at the funeral home on Saturday from 3:00 PM until time of service. Memorials in Darin’s name may be directed to the Stomp Out Cancer Fund. Please visit Darin’s personal page of memories at www.oakgrovefh.com to share a story or photo. The family has entrusted the Oak Grove Funeral Home & Cremation Center with funeral arrangements. To send flowers to the family of Darin John Albright, please visit our Heartfelt Sympathies Store.